It is necessary that every person has to break the shell and start exploring new places once in a while. You don’t have to pack your bags and go off shores to enjoy a holiday and explore new places, look around and you will find many enthralling places in Telangana itself. One such amazing place you must see is the Mallela Theertham. This waterfall is a true gift of nature. Located in a valley, this exquisite place takes nestling at the Nallamala forest Range. The waterfall runs down with all its energy, making its own path and breaking free from the heart of a dense forest. The amazing sight calls for attention, because you just can’t miss looking at heaven. The fall is directed on small Shivling, and the height of the waterfall is about 150 feet. Though the flow gets narrow in summers, the place looks beautiful throughout the year. The water that flows through the dense Nallamala forest belongs to a small stream, which later becomes one with the mighty river Krishna. What adds the exquisiteness is that the Nallamala Forest is the largest stretch of undisturbed deciduous forest in south India. Mallela Theertham is located approximately 190 kilometers from Hyderabad on the way to the holy city of Srisailam. The location also lures adventure seekers as it serves an excellent host for River crossing, Trekking, Sliding, and Camp Fire. 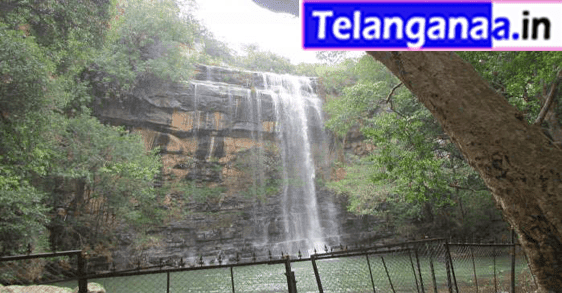 The waterfall is located around 185 km from Hyderabad, close to Srisailam Dam. While travelling from Hyderabad towards Srisailam, tourists need to look out for Vatvarlapally village located on the highway nearly 30 Kms from Mannanur forest check post. From the village, one has to left turn and drive about 8 Kms through villages. Light snacks and cool drinks are available at a small shop as well as bottled mineral water. Tourists can enjoy food near hotels close to Mannanur forest check post. Mannanur forest guesthouses are ideal destination for accommodation.